Try your hand at our recipe for Just-Like-Mom's Apple Crisp. 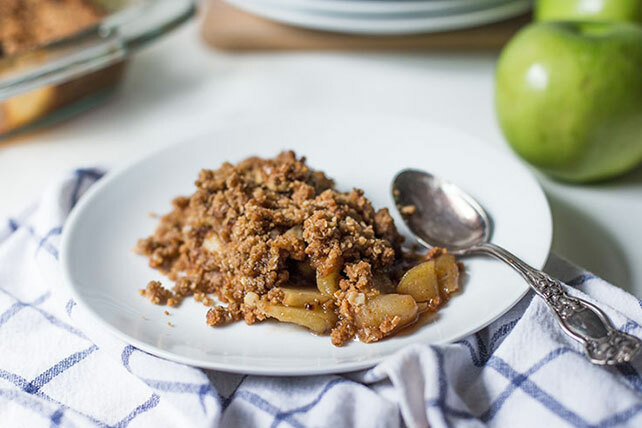 This is quite possibly the most fragrantly cinnamon-y apple crisp in the world! Mix oats, graham crumbs, 1/3 cup each brown sugar and flour, nuts, butter and 1/2 tsp. cinnamon until well blended; set aside. Mix 1/2 cup brown sugar, 2 Tbsp. flour and remaining cinnamon in large bowl. Add apples; toss to coat. Place in 8-inch square baking dish; sprinkle with oat topping. One serving of this warm, fruit crisp makes a nice dessert for an autumn night. For eating or cooking, choose all-purpose apples, such as Cortland, Granny Smith, Jonathan, Fuji, Jonagold or McIntosh. For eating raw, choose Gala, Golden Delicious or Red Delicious. For cooking use, choose Rhode Island Greening, Rome Beauty or York Imperial. Place grahams in large resealable plastic bag; seal bag. Crush grahams by using a rolling pin to roll back and forth over the bag.